It Pays To Tell Your Friends About WesternHunter.com! James Roscoe of Antioch, California was the winner of our Share The Secret contest. Jim won a free, guided wild hog hunt with Antelope Valley Hunting Club out of Williams, California. Jim's name was entered in the Share The Secret drawing because he told a friend about WesternHunter.com and that friend mentioned Jim's name when they signed up for our free weekly hunting information service. On March 25th, Jim Roscoe bagged this 300-pound boar which had 3-inch tusks. 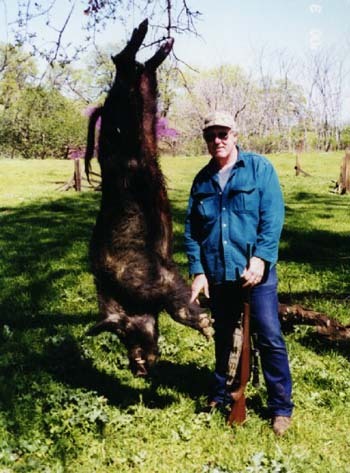 Jim tells us, "I'm 6'4" and weigh 260 pounds so you can tell it's a big hog from the picture. I shot him with a Remington 700 ADL in 7mm mag, 160-grain Nozler Partition bullets." I went on the hunt today. I killed a very nice boar. It was a great hunt. After seeing some hogs early on and making an unsuccessful sneak, it seemed we just couldn't locate any more. We were seeing a lot of sign but no hogs and the weather was warming up. John and Tom were very persistent. They kept trying to locate hogs and at about 10:30 we were glassing a hillside when I spotted a boar. Tom utilized my rangefinder and said the distance was 254 yards. I got a good rest on an oak limb and rolled him with one shot right behind the head. I left the head with the taxidermist that Tom knew in Williams. Both Tom and John are real good fellows who definitely know what they are doing and I will highly recommend them to others. I plan on booking a hunt next year and take along my son-in-law. I am also going to try to make the opening day dove shoot with them. Again I would like to thank you for the hunt. Copyright © 2000 J & D Outdoor Communications. All rights reserved.